Today is my dad's birthday. Tyler, Tristan and I took him to Texas Roadhouse for dinner, then we went back to Mom and Dad's. 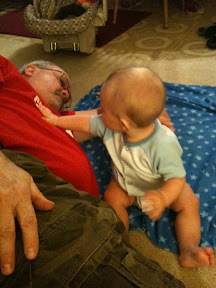 Dad and Mom played with Tristan while we waited for Bub and Chelle to show up for cake. HAppy birthday to your Dad...Bryce's is today. Love his Reds shirt! I think he either wears a Reds shirt, Bengals shirt, or Marshall shirt everyday. He's a sports guy. 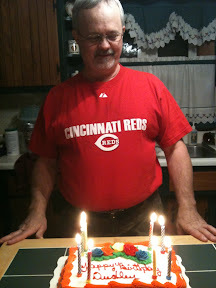 He has been a Reds fan his whole life, saw the Big Red Machine in the '76 World Series.